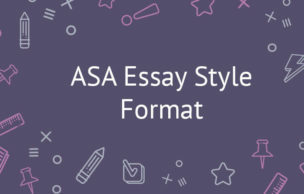 Various schools have different format requirements to essays and other writings. If you study liberal arts and humanities, your school will normally use the MLA (Modern Language Association) style. It suggests a title page, in-text citations, as well as footnotes and endnotes, and the bibliography at the end of your paper. All pages (except the first one sometimes) are numbered and marked with the essay author's name in the upper right corner. several lines lower you write the following (in this particular order): the author's name, the advisor's name, the name of the course, the date of completion, - each on a separate line. Normally, there are no special formatting requirements to the header. Just as with the rest of your writing, the recommended font is Times New Roman 12, and the spacing is double. After this, you write the title of your essay in the center. No quotations or italics are used in the title, unless any other works are referred to. Remember that the author's name still needs to be placed in the upper right corner. Note that the requirements to the header can be modified by your advisor for the sake of the paper's readability. a parenthetical citation consists of two elements: the author's name and the page number. They are separated by a comma. Either or both or these elements can be omitted, if they were mentioned in the sentence proper. with more than three authors: the most important element in comprehending non-native speech is familiarity with the topic (Gass et al., 84). the title of the referenced work and page number: If you are citing an article with no known authors, you are to cite the title. If you deem the title too long to be cited in full, you can abbreviate this title. Example: Research shows that listening to a particular accent improves comprehension of accented speech in general (The Effect of Familiarity on the Comprehensibility of Nonnative Speech, 32) – or (EFCNS, 32). author's name and no page number: The listener's familiarity with the topic of discourse greatly facilitates the interpretation of the entire message (Gass & Varonis). web article with author's name: Last name, First name Middle name initial. “Title.”Website title. Website Publisher, Date Month Year Published. URL. Date Month Year accessed. Example: Dean, Cornelia M. "Executive on a Mission: Saving the Planet." The New York Times, New Yor Times, 22 May 2007, www.nytimes.com/2007/05/22/science/earth/22ander.html?_r=0. Accessed 12 May 2016.
web article without author's name: “Article Title.” Website Title. Website Publisher, Date Month Year Published. URL. Date Month Year accessed. Example: “Review of An Inconvenient Truth, directed by Davis Guggenheim.” rogerebert.com, Roger Ebert, 1 June 2006, http://www.rogerebert.com/reviews/an-inconvenient-truth-2006. Accessed 15 June 2016. Book: Last name, First name Middle name initial. Book Title. City of Publication: Publisher, Year Published. Print. Example: Leroux, Marcel. Global Warming: Myth Or Reality? : The Erring Ways of Climatology. Springer, 2005. Print. newspaper article: Last name, First name Middle name initial. “Article Title.” Newspaper Title [City], Date Month Year, Published: Page(s). Print. Example: Revkin, Andrew C. “Clinton on Climate Change.” The New York Times [New York City], 17 May 2007. 11-12. Print. journal article: Last name, First name Middle name initial. “Article Title.” Journal Title Series Volume.Issue (Year Published): Page(s). Database Name. Web. Date Month Year Accessed. Example: Gowdy, John. "Avoiding Self-organized Extinction: Toward a Co-evolutionary Economics of Sustainability." International Journal of Sustainable Development and World Ecology, vol. 14, no. 1, 2007, 27-36. Print. All these MLA rules and regulations can be a bit confusing. Even if you write a stunning essay, a failure to comply with the tiniest of the guidelines may stand in your way. If you feel unconfident, consider addressing a custom essay writing service for professional help. They deal with essays every day, so they know how to make sure that no small detail is missed.